"The stock market is near its high and the economy is noticeably weaker - and yet everyone is saying ‘Everything is Great!’"
And while the fintwit peanut gallery, desperate for approval within its own tiny echo chamber of mediocrity was quick to mock Gundlach (a self-made billionare) and his latest bearish call, it appears that those who actually trade instead of merely pretending to, agreed wholeheartedly with the bond (or is that unconstrained) king. 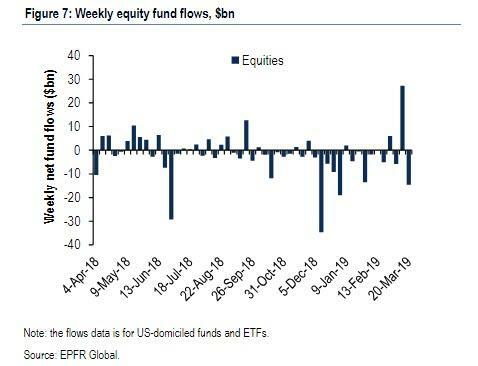 According to the latest EPFR data, whereas the last week saw the now traditional safe haven flows, with $12.1 billion flowing into bonds, the big surprise was that $20.7 billion streamed out of equities, which as BofA's Michael Hartnett said, was "a complete reversal of last week's "green shoot" $14bn equity inflow" as there is "simply no love for stocks." Or in other words, and as we have repeatedly noted, Wall Street is convinced that this is nothing more than, wait for it, a bear market rally. A quick look at the details of the latest fund flows reveal that the continued need for yield meant inflows of $6.6BN to IG bonds, $3.2bn to HY bonds, $1.2bn to EM debt; this was a big contrast to outflows of $13.2bn from US stocks, a violent reversal to last week's second biggest inflow ever, when $27.3 billion in capital was plowed into equity funds. 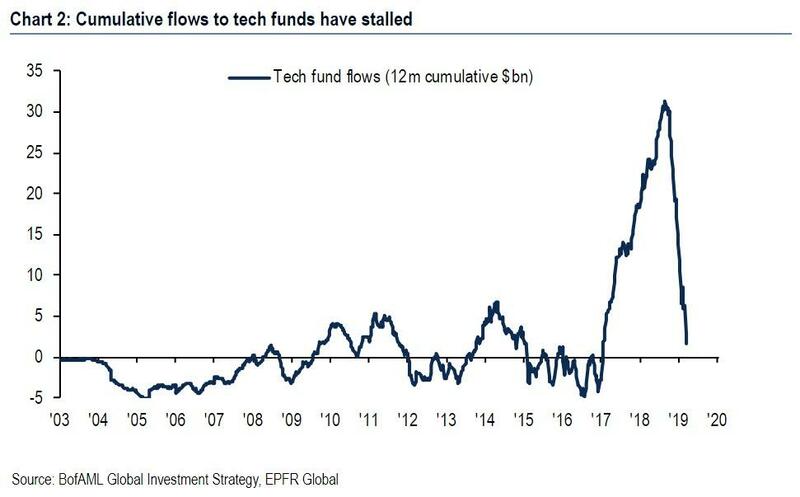 It wasnt just the US: $4.0 billion was pulled from EU stocks, $0.4bn from EM stocks, and most notably, $0.6 billion was redeemed from the 2018 darling - tech stocks, where cumulative flows to tech funds have hit a brick wall. "US/EU/Japan stock gains solely driven by corporate buybacks/derivative call buying/short-covering/ retail single stock buying." The problem, as we noted earlier this week, is that the buyback period is starting. 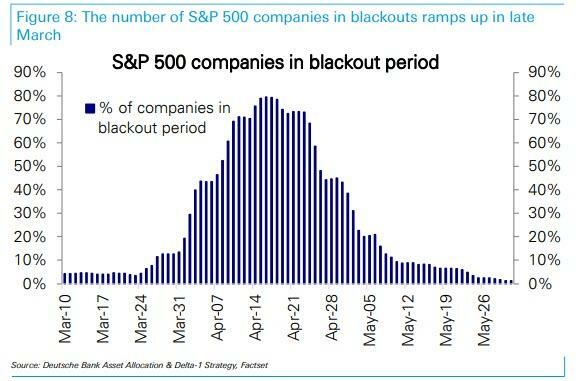 It's a problem because as Deutsche Bank's Parag Thatte warned, "the outsized role played by buybacks in driving the rally in this recovery cycle as well as investor attention focused on the blackout period recently adds to the risks highlighted above." The extraordinary abrupt end to central bank hiking cycle + Fed paranoia of credit event is uber-bullish credit & uber-bearish volatility; end-2020 consensus forecast for 10-year JGBs just 0.2%; 40 global central bank hikes in 2018, S&P 500 PE multiple -4 points; end of tightening in 2019 consistent with equity market re-rating (Chart 4); S&P500 multiple has risen from 14.6 to 16.6 this year (today S&P500 2843 & EPS $171)…higher multiples likely. 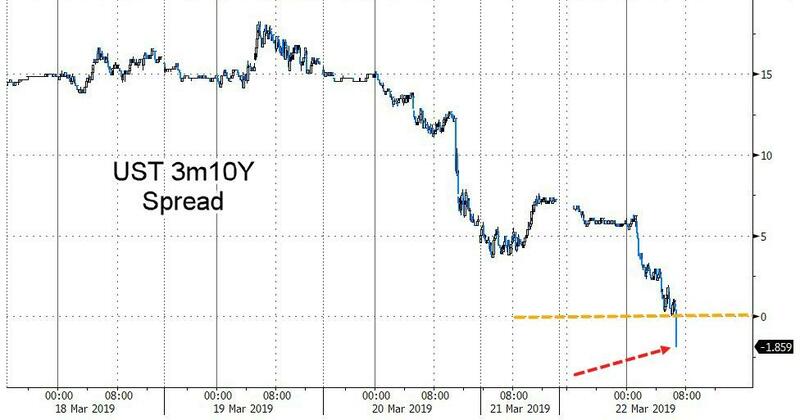 ... markets are effectively saying that not only did the Fed commit a policy error, but that the Fed itself may have lost control. EPS lead indicators still poor (e.g. Korea March exports -4.9%, first 20 days, need to see EU mfg new export order PMI rebound >50 tomorrow); yet central bank capitulation means investors in "bad news is good news" mode…semiconductor stocks (SOX index) at all-time high today despite Korea chip exports -25%; cyclicals have discounted coming inflection point in EPS; inflection point likely has bigger impact on bond yields and bank stocks (both higher) and will signal beginning of end of rally. Which brings up the key question: is the most hated "bear market rally" inside the "most hated bull market" of all time finally over?